How Can Cloud Service Providers Help Hospitals Stay Competitive? We’re a decade into cloud computing and hospitals have finally come online. The days of strictly on-premise hardware in hospitals are declining; most hospitals have now conceded that hybrid models incorporating cloud service providers remain a smarter way to store data, manage costs, and improve efficiencies. Cloud service providers are helping hospitals remain competitive by staying responsive to consumer demands in a digital marketplace. This paper looks more closely at how the climate has changed and how healthcare providers are responding and reaping the benefits of cloud computing. The reimbursement models have shifted from volume to value-based care. Hospitals will be reimbursed not by the quantity of service but by the quality of care and their ability to proactively help consumers improve their healthcare outcomes. The days of the infallible white-coated doctor are over. Consumers are increasingly involved in their own care, seeking education about medical treatments and wearing devices that track their health outcomes. They’re also reading and recording their observations and opinions on the quality of everything – and that includes their medical providers. Healthcare is growing more competitive, with the “winning” providers offering new services like virtual appointments and personalized web portals where consumers can view test results and book appointments. Some ERs are even publishing their wait times on line. Healthcare reporting has grown increasingly complex; regulations have grown more restrictive in tandem with declining reimbursement for Medicare and Medicaid. The interoperability between reporting mechanisms within the hospital setting has been a crucial part of the reimbursement process. 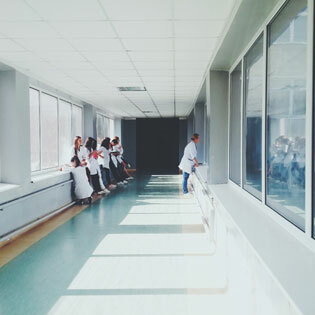 Many hospitals have found that shifting IT infrastructure models to incorporate cloud service providers is the perfect response to this rapid shift in consumer and regulatory trends. Today, hospitals are replacing traditional on-site hardware with cloud service providers in a variety of “as-a-service” models. They are investing in digital start-ups that allow consumers more access and transparency. Hospitals have also embraced the standard benefits of cloud computing, namely, lower costs, a more flexible infrastructure, and scalability. Get a free assessment to see if your hospital is ready for cloud service models. There are economic benefits that help hospitals avoid the excessive capital costs of IT hardware. Cloud service providers help eliminate the need for staffing overhead within a hospital IT department. They can also supplement an existing team, freeing up internal tech resources to focus on other hospital projects. There are also benefits for operations that include the ability to scale up or down with services as needed when working with cloud service providers. Data security and operating systems are more up-to-date in cloud models. From encryption to the latest security patches, data is safer in the cloud. Cloud service models also improve the functionality of IT architectures, with APIs allowing interoperability between hardware and software in the cloud and on-site. Cloud service providers have standardized protocols that allow them to seamlessly integrate between all the complicated components of today’s modern hospital IT frameworks. Sharing data is crucial and will soon be tied to value-based reimbursement metrics for healthcare providers. access for consumers that are hungry for new, more digitally savvy services. Patients want coordinated care, they want to see test results online, and they want the option of a virtual visit with the healthcare provider of their choice. Cloud computing lets hospitals respond to these demands. Finally, cloud service providers are helping hospitals improve patient outcomes by monitoring their care after a complex surgery. Many of the most difficult surgeries require home-based aftercare in order to affect a successful treatment outcome. IoT (Internet of Things) monitoring devices can track patient treatment plan compliance. Monitoring devices can make it possible for patients to communicate with nursing teams about their care without having to make another difficult, time-consuming, and possibly painful or stressful trip back to the medical facility. This diagnostic support is crucial to both patient satisfaction and patient care. Conclusion – What’s Next for Hospitals and Cloud Service Providers? The benefits of hospital—cloud service provider partnerships are clear. It’s predicted that hospitals will continue to adopt cloud methodologies to benefit their patients and their bottom line. As the volume of IoT devices expands the necessity of storing all the data we will collect from patients will necessitate cloud service provider models for more bandwidth. Ready to take your healthcare facility into the future? Request a quote for TOSS C3 cloud service models today.